The post will cover the Imbolc ritual and celebration held by the Circle of Fountains. For my Imbolc altar, click here! 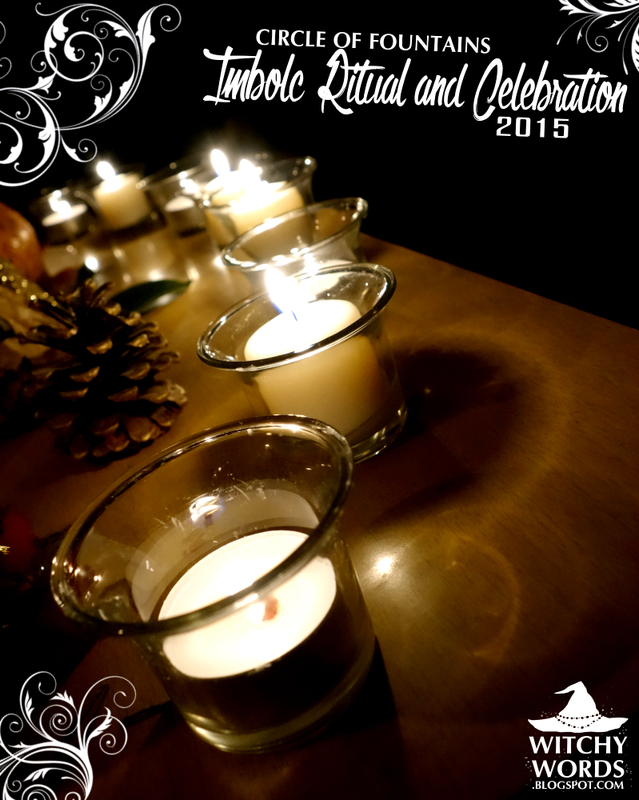 For Liithi Lushede's public Imbolc ritual 2014, click here! 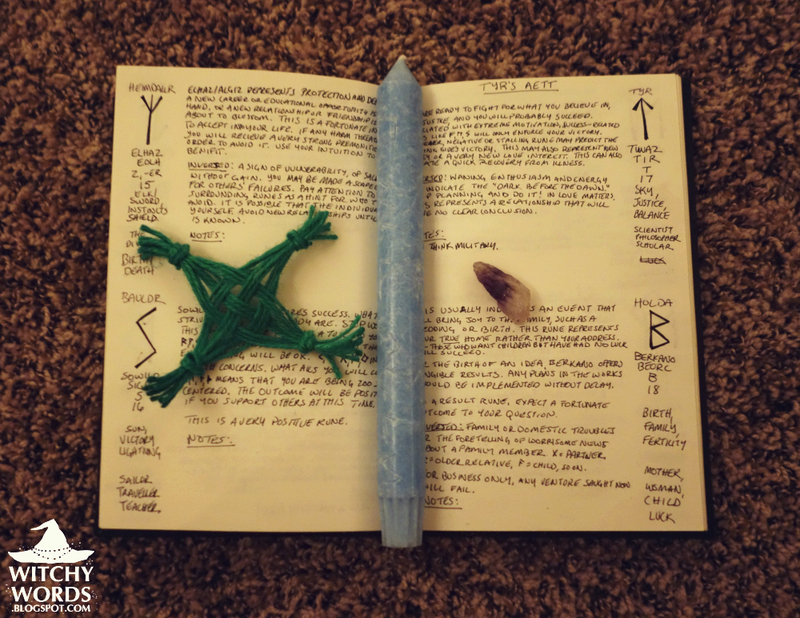 For the Circle of Open Traditions Imbolc ritual 2013, click here! 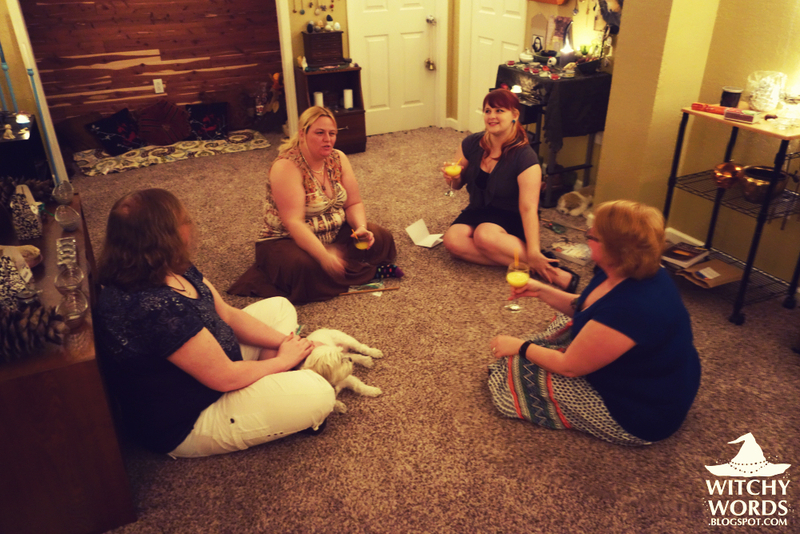 Circle of Fountain's Imbolc ritual was written by Jessica this year (by the way, you should check out her new blog linked here!). We held it a few days before the actual sabbat as Liithi Lushede's ritual will be held on the sabbat itself. Imbolc celebrates the midpoint between the winter solstice and the spring equinox, recognizing the stirring life under the frozen ground. For many pagans, this holiday is closely associated with the goddess Brigid. Earning sainthood in Christianity, Brigid is associated with fire and grain. Some pagans and Wiccans instead celebrate the God as a toddler barely stirring from his sleep and the Goddess as a maiden with her bosom full of milk. In fact, the word Imbolc itself either comes from i mbolc, meaning "in the belly," or oimelc, meaning "ewe's milk." Imbolc as a holiday sometimes gets overshadowed. It follows two of the biggest sabbats of the year, Samhain and Yule, and is the first holiday of the year, just one month after New Year's Eve. I often see a natural decline in attendance for Imbolc, and this sabbat was no different. 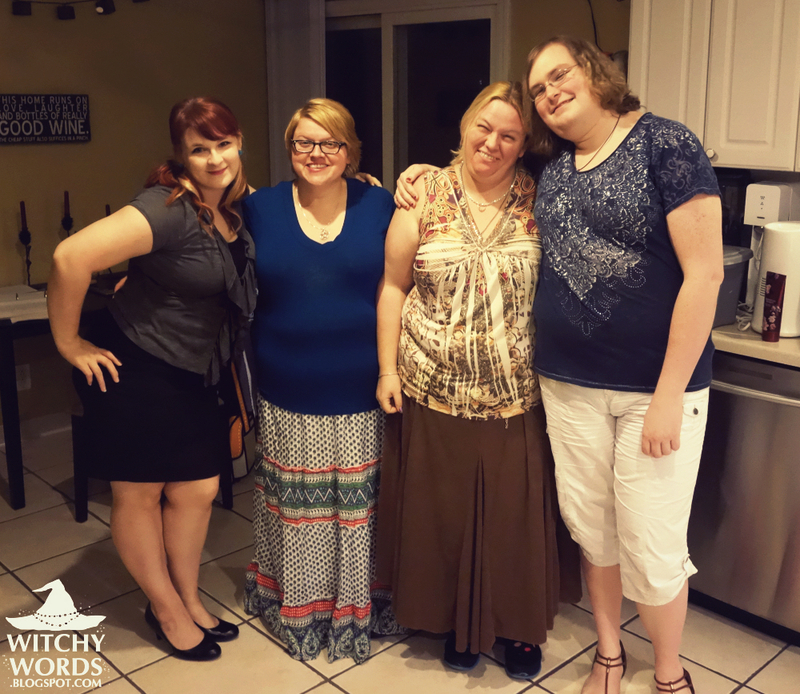 However, with such a small group, we were able to have a more personal experience with the holiday and the wonderful ritual Jessica wrote! 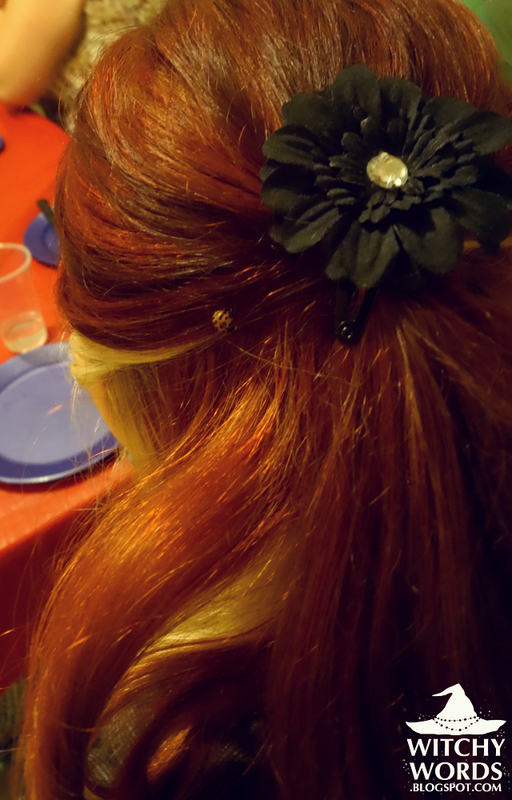 Though I suppose we did have a small additional guest this year, as a lady bug stayed in my hair until ritual and fluttered off into the spiritual room! A sign of good luck, I'm incredibly hopeful about what this part of the season will bring. 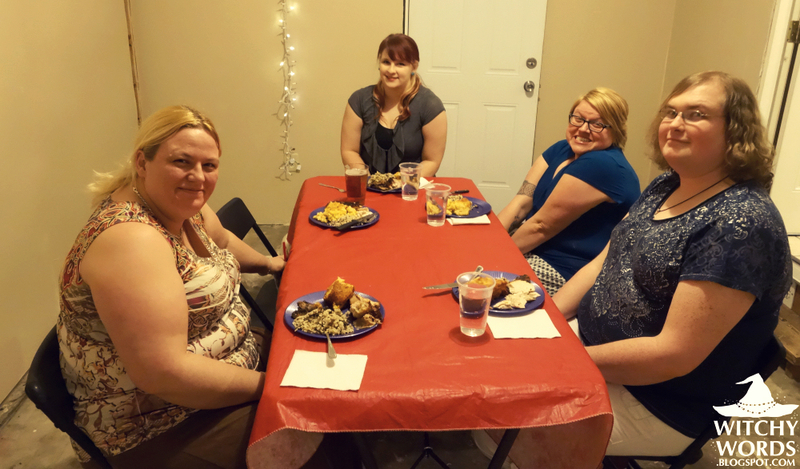 First, we feasted on a wonderful pot luck meal. 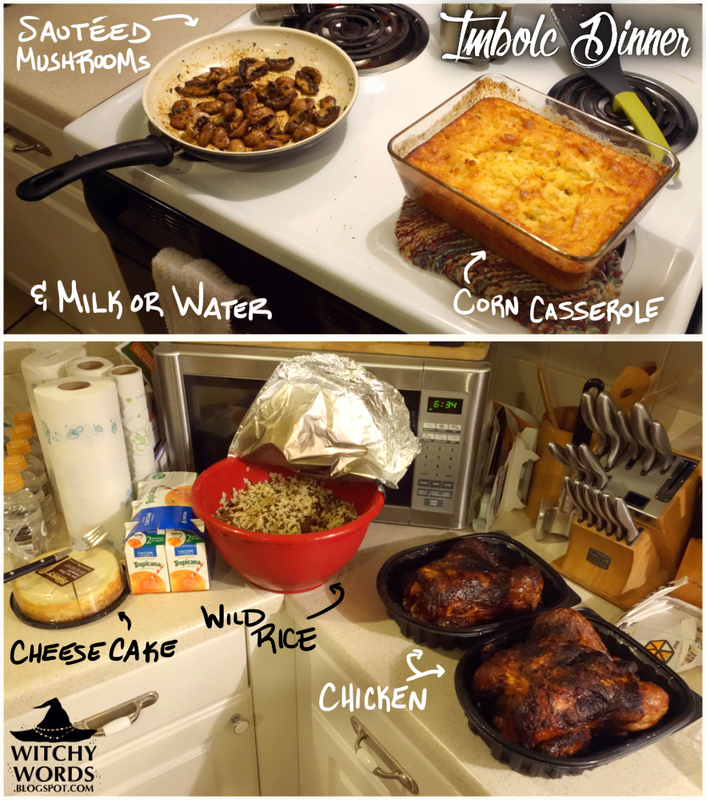 Kira brought corn casserole, Phaedra made wild rice, I purchased some wonderful rotisserie chicken and Jessica came with sauteed mushrooms and cheese cake! It was absolutely wonderful! After dinner, we proceeded down to the spiritual room for ritual! 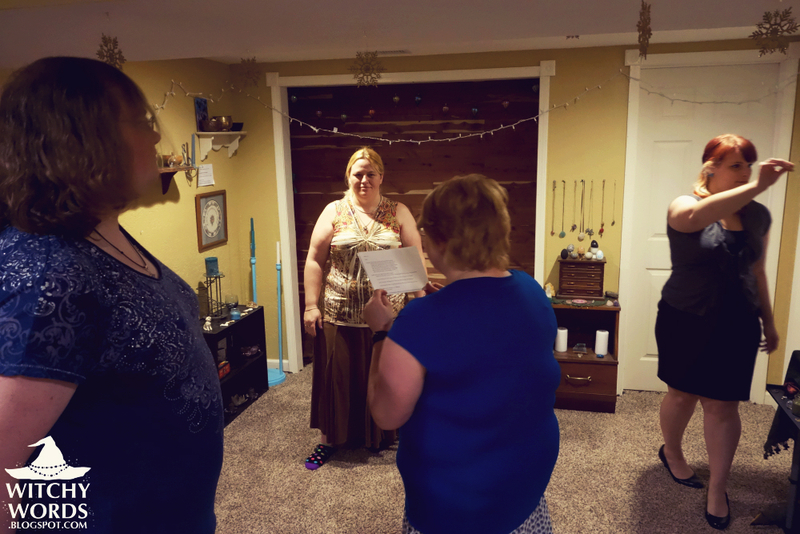 We opened the circle by marking the boundary with incense while Jessica read a short poem about working together, using the sun to illuminate the room and shining from within. We then called each of the quarters one by one starting with East. Upon lighting each corner candle, we spoke of growth, prosperity and nourishment. We began by pouring glasses of orange juice, representing the coming sun, and sitting down to a Bardic Circle. In the circle, we each shared a joke, story, song or poem that we felt was appropriate for the time. Before and after our turns, we took a sip of orange juice and finished it off at the end. 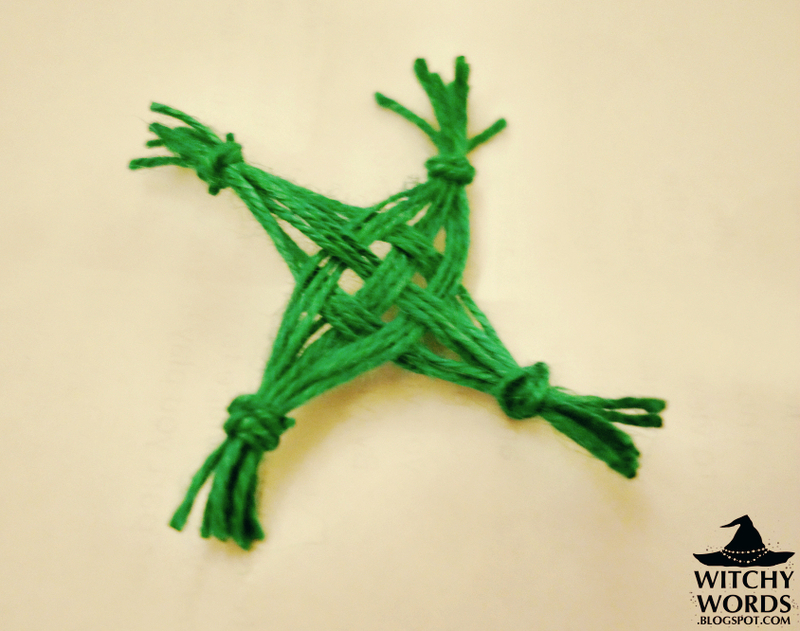 The next step of Jessica's ritual was creating a variation of a Brigid's Cross known as a binding knot. 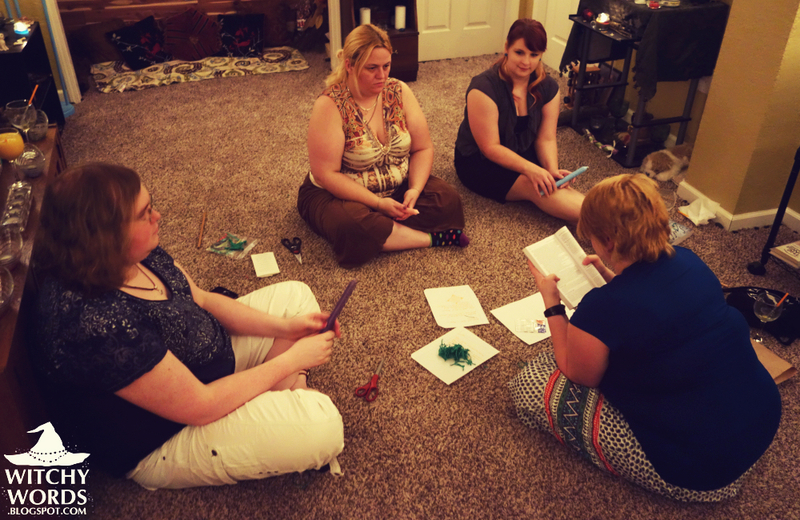 Jessica guided us through making the knot during ritual, but I simply could not find a tutorial online. 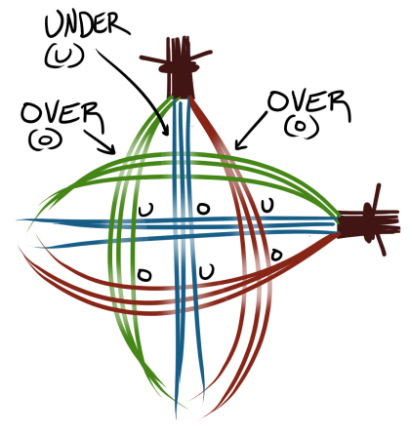 Enjoy my crazy quick and super sketch guide to the Derry version of a Brigid's Cross! You'll need to get some sort of ribbon or twine, preferably textured and relatively stiff as it makes it much easier. You could also do this with palm material or corn stalk if you prefer. Start off with 18 pieces of equal length, separated into two piles of nine, and four extra pieces for knotting the ends. 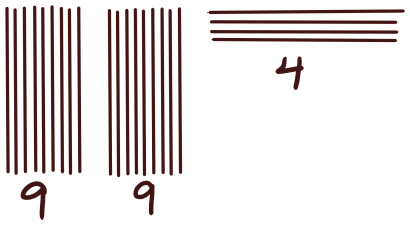 Your four extra pieces could be of any length because you can cut off the excess if needed. 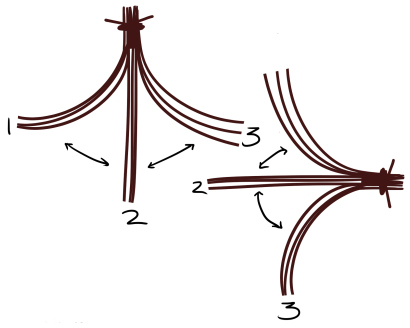 The first step is taking two of your extra pieces and knotting the top of each of your sets. 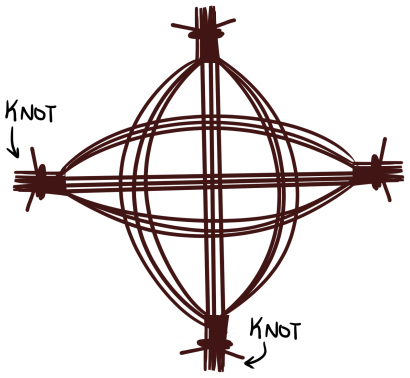 Leave about a centimeter to an inch before your knot, and make sure that knot is very tight and secure. It's very important that it doesn't slip or move around! Once you have it braided, pull the sets together so that they hold their shape and aren't loose. 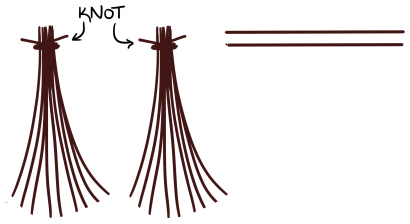 The braid shouldn't fall apart if picked up. 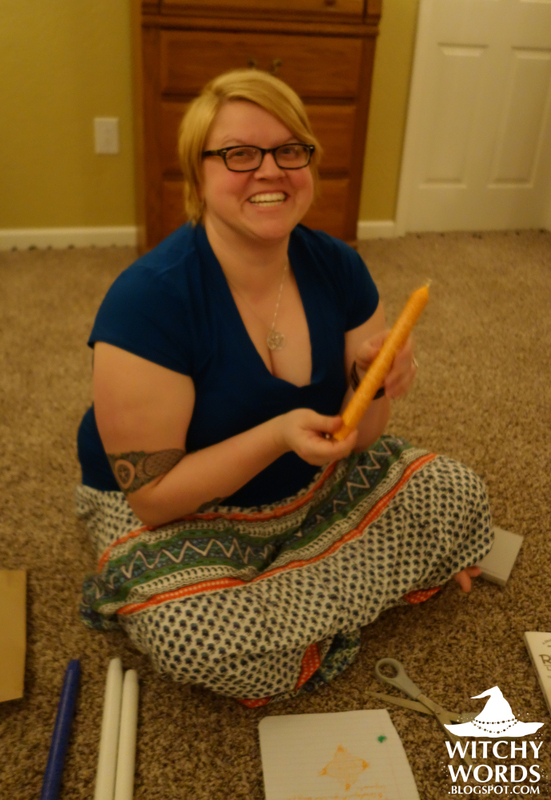 In addition to the braided knots, and perhaps the biggest part of the ritual, Jessica gave each of us a dedication candle for Imbolc. 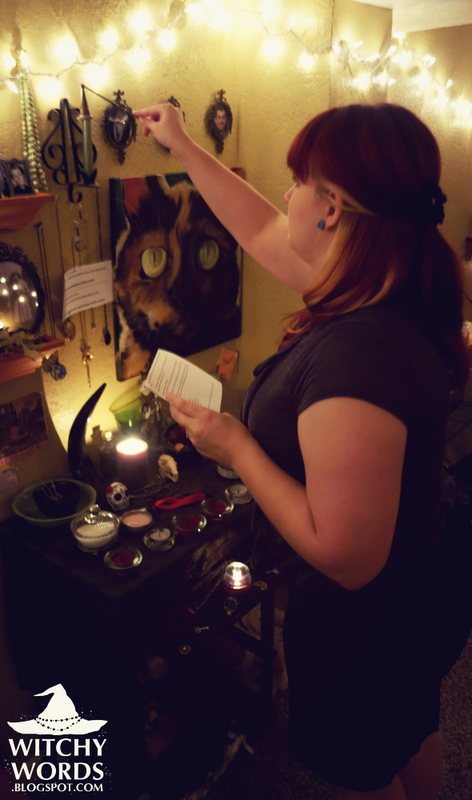 Prior to the ritual, Jessica gave us a short list of color correspondences and asked us to choose something that related to what we wanted to draw to ourselves in the upcoming months. 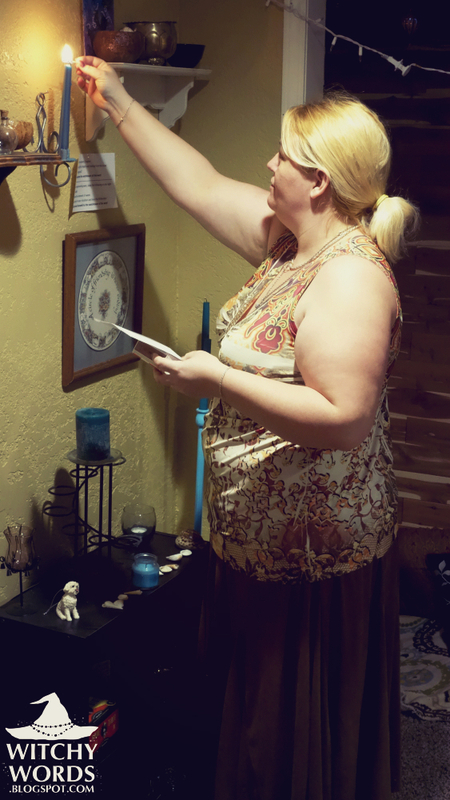 She then went to our local metaphysical store, Aquarius, to purchase spell candles of the appropriate colors and sizes. We then spent the next thirty minutes carving symbols and words into our candles that meant something to our path for the upcoming months. As usual, I chose runes. 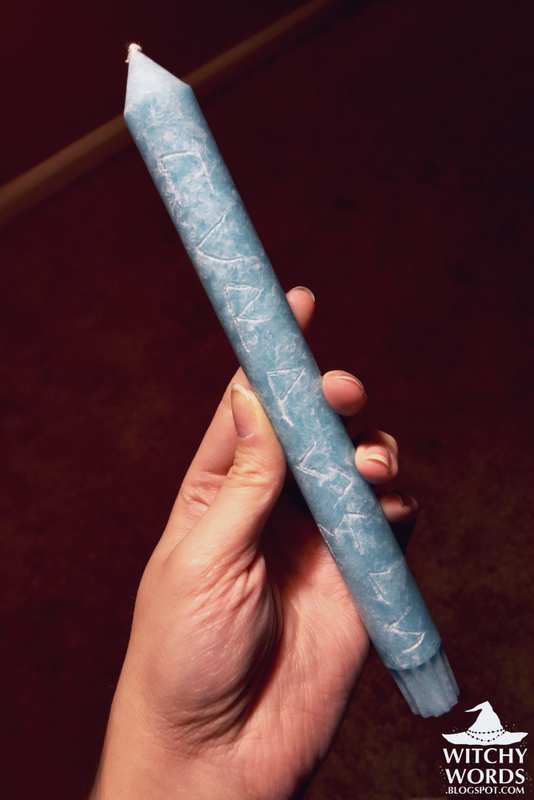 Because my candle's color symbolized balance and healing, I picked out runes like Tiwaz, which is a balance and justice rune, and Wunjo, which represents joy. I repeated both of those runes three other times around the candle, while I simply included one rune for the rest. Some of those runes included Uruz for strength (you'll recognize that one from my Yule ornament), Jera for harvest and cycles, and Sowilo for success. 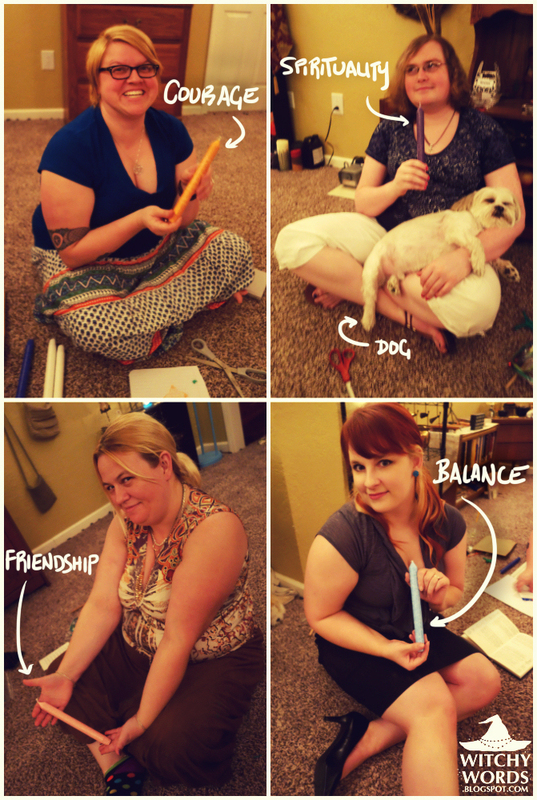 In addition to all of this, Jessica also gave us a kit for making Priapic Wands and a bit of raw amethyst for cleansing and charging! 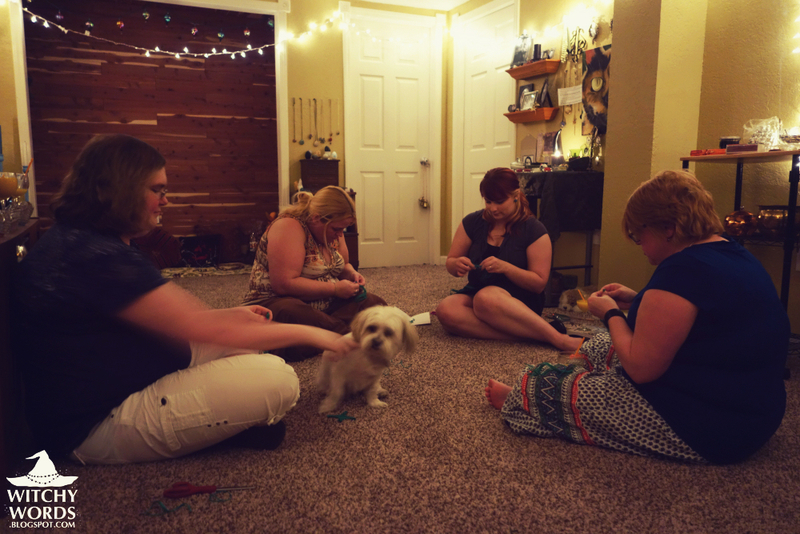 We had so many fun activities and so much we walked away from the ritual with. After that, we released the elements one by one thanking them, and closed the circle! And that concludes the Circle of Fountain's Imbolc ritual for 2015! From my circle to yours, we wish you the best and brightest Imbolc! To see the previous sabbat, Yule, click here! Love your ideas! Going to use a couple tonight! Thank you so much! Our ritual for this year is also up if you'd like to take a look - just go to the main page! Looks like a wonderful time! Btw-Jessica's blog is not open to the public. ( in case others are trying to access it) It looks like you all shared so much. Thanks so much for sharing! Jessica closed her blog sometime after she left CF. Thank you for reminding me though! Our new Imbolc ritual is up if you'd like to take a look. Best wishes to you!